Pet-Friendly Branford Home - 10Min Walk to Beach! Connecticut is calling you to stay at this charming 3-bedroom, 1-bath vacation rental apartment! Nestled among the quiet streets of Stony Creek, this pet-friendly getaway boasts sleeping arrangements for 6, modern conveniences, and a prime location, just a 10-minute walk from the beach. Whether you spend your days exploring the coastal sound, touring the Thimble Islands, or discovering the friendly village of Stony Creek, you're sure to love returning to this 100-year-old home each evening! Discover your home-away-from-home on the second level of this 2-story house, which was constructed over 100 years ago. Though the home maintains much of its historic charm, it's been updated with modern appliances and furnishings. You're sure to love returning to the spacious living room after days out-and-about, as it features 2 plush couches, a flat-screen TV, and wireless internet access. As you relax in the living room, let your four-legged friends run around and play in the spacious yard! The kitchen is well-equipped with all your culinary essentials, including modern appliances and cookware! Prepare a delicious home-cooked meal before gathering at the 4-person table for a quality meal with your travel companions. When you're ready to retire for the night, curl up in the first bedroom's cozy queen bed while others sleep soundly in the remaining 2 bedrooms. Additional sleeping arrangements can be found using the comfortable futon in the living room. A day on the coast is mere minutes away! Put on your swimsuit and head down to the beach where you can explore the cool canal waters and blissfully watch various birds soaring through the wind, such as Ospreys, White Herons, Egrets, and Seagulls. Stay by the beach until day turns to night when you can watch the gorgeous sunset over the water. Also close to the home are several trails that meander through lush marshlands, as well as the small village of Stony Creek. Here, you'll have access to the marina, Thimble Islands Ferry Service, and Stony Creek Market. To experience the attractions of New Haven, cruise just 20 minutes west! You won't want to miss out on the art galleries at Yale University and fantastic seafood restaurants all over town. While you're out, be sure to stop by Lighthouse Point Park to check out the historic 1847 building! - Amenities include a well-equipped kitchen, cookware, dishware, a flat-screen TV, free WiFi, central heating and air conditioning, ceiling fans, linens, towels, complimentary toiletries, shared laundry machines, pet friendly, beach towels and chairs, driveway parking, and more! 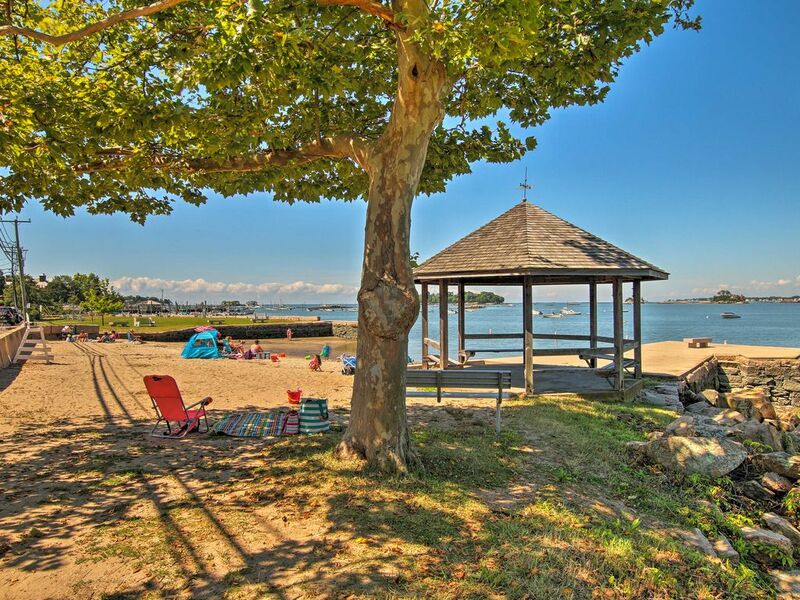 - Fantastic Branford Location - A short walk from the beach and Stony Creek village, plus only 20 minutes from New Haven! Spent a long weekend with old high school friends from years past. Location was convenient, small town was charming. Walked around nearby harbor with view of houses on islands. Easy 20 min drive to New Haven dining and sightseeing. Drove 45 min to Mohegan Sun for dinner and some casino fun. Grocery store close by. Owners were as nice as possible and provided every amenity. House was excellent - really enjoyed everything about the trip. Would certainly return again. My family and I had a nice stay in CT. The property was clean and well appointed, and the hosts went the extra mile to ensure that all of our needs were met. Wonderful peaceful with super kind hosts. Jean and Paul rock. They made the whole experience that much better. Great place plenty of space in a super quiet and peaceful neighborhood a 5 min walk from the water.